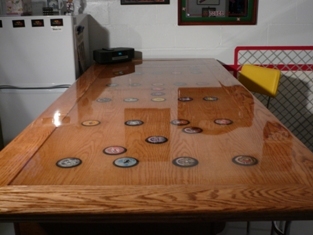 Product #214 Water Clear Epoxy Casting - Tabletop Resin - Bar Top Resin is an all-purpose, low viscosity epoxy resin system for coating wood and concrete counter tops, tabletops, bar tops and similar applications. Product #214 Water Clear Casting-Tabletop-Epoxy Bar Top Resin is commonly used as a clear self-leveling flooring material, where an extremely flat and level floor is required over concrete and wood. Product #214 Casting-Epoxy Tabletop-Epoxy Bar Top Resin is used extensively for ultra flat leveling of surfaces under equipment, where a very strong ultra flat bearing surface is a must. It is also used successfully for ultra flat floors for stages, dance floor, and clean rooms. Product #214 Clear Casting-Tabletop-Bar Top Resin is used as a clear adhesive matrix for specialty colored glass and colored aggregate flooring and tiles. Product #214 Clear Casting-Clear Tabletop Resin - Clear Bar Top Resin forms a glossy, hard surface, which is resistant to stains. It is also used extensively as a water clear casting resin. Product #214 Clear Casting- Clear Tabletop- Clear Bar Top Resin has excellent clarity and color retention. Product #214 Clear Casting Resin-Tabletop Resin-Bar Top Resin has zero (0) VOC making it essentially odorless and can therefore be used in occupied areas. Zero (0) VOC - No VOC means it meets the toughest low VOC standards. Minimum application temperature of Product #214 Clear Epoxy Casting-Tabletop-Bar Top Resin is 50° F.
Substrate to receive Product #214 Water Clear Resin must be free of curing agents and any foreign materials. Surface Preparation is the most critical portion to any successful epoxy application. All substrates to receive Product #214 Water Clear Casting-Tabletop-Bar Top Resin must be properly cleaned and prepared. Substrate must be free of oil, paint, sealer, caulking, and all other contamination that will interfere with the bonding of this material. Please see Surface Preparation. Contact us for more details. Stir each component separately. Combine 2 parts A to one part B by volume into a clean container. Stir for three minutes, with an Mixing Paddle, scrapping bottom and sides of container frequently. Do not add thinners. Pot Life (200 gr.) 30-40 minutes @ 70° F.
Application of Product #214 Water Clear Resin will vary with application method. Be careful not to incorporate bubbles into the coating. Typical pours are in the 1/16 inch to 1/2 inch thick range per coat. If a second coat is desired, remove all dust, if more than 24 hours after the last coat lightly sand, and then apply second coat. Keep away from children. Refer to the Material Safety Data Sheets (MSDS forms) pertaining to this product before using. Avoid contact with skin or eyes. Prolonged or repeated exposure may cause eye and skin irritation. If skin contact occurs, wash immediately with soap and water. If contact with eyes occurs, flush eyes as required with clean water and seek medical help. Use safety glasses with side shields and wear protective rubber gloves. Remove Product #214 Water Clear Resin from all tools and equipment before the system gels. Use MEK, Acetone, or any lacquer solvent. R=Recommended for continuous service L=Limited recommendation, occasional spills. Coverage: 231 cubic inches per gallon. At 1/8 inch thick 12.8 SF Per gallon. Use the Top Resin Calculator to double check your estimate. Information on using Table Top Resin in a River Simulation.